Henry David Thoreau published two books and numerous essays during his lifetime and many more of his works were published after his death in 1862. 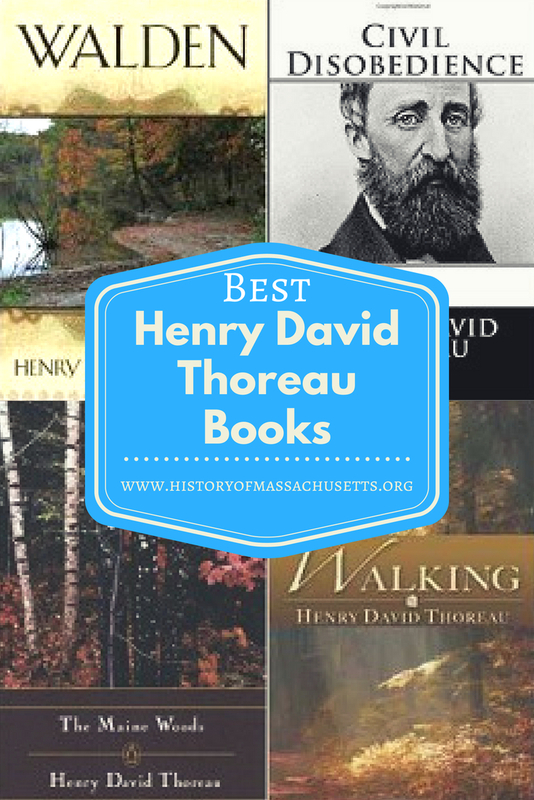 Deciding on which of these Thoreau books or essays you should read really depends on what type of Thoreau writing is your favorite. If you are more of a fan of his political writing, then his essays and books such as Civil Disobedience, Slavery in Massachusetts and John Brown are probably more your style. If you are more drawn to his nature and philosophical writing, then Walden, Walking, Wild Apples, Cape Cod would be a better option for you. Published in 1854, Walden is Thoreau’s most famous book and many would argue is his best. The book is about the virtues of simple living and self-sufficiency in a modern world and was inspired by the two years Thoreau spent living in a small cabin at the edge of Walden Pond in the 1840s. The book is a complex work that is part memoir, part sermon, part manifesto and, at its heart, is about how to live a full and meaningful life amid a world full of drudgery and meaningless distractions. Walden was moderately successful when it was published, but took five years to sell 2,000 copies. It then went out of print until Thoreau’s death in 1862. It has since become an American classic. The book received a number of favorable reviews when it was originally published in 1854, though its unique perspective and subject matter perplexed many reviewers. As beloved as the book is, modern readers still sometimes struggle with the old-fashioned prose as well as the overall message of the book, as can be seen from the handful of reader reviews on Goodreads and Amazon criticizing it as judgemental, elitist and hard to read. Published in 1849, under its original title of Resistance to Civil Government, this essay advocates resistance to unjust laws and governments and was inspired by Thoreau’s experience of being arrested and jailed for refusing to pay his poll tax because he believed it was being used to fund the Mexican-American war, which he opposed. Published posthumously in 1864, the book chronicles three separate trips Thoreau took to the woods of Maine in the 1840s and 1850s. It consists primarily of a series of articles previously published in the Atlantic Monthly Magazine in 1858, as well as some unpublished material, that describe the Maine landscape and identify the types of trees, plants and animals of the area while also weaving in a bit of philosophy from time to time. Published posthumously in 1865, this book is similar to Thoreau’s other book The Maine Woods because it is about three separate trips that Thoreau took to Cape Cod in the 1840s and 1850s. It consists primarily of a series of articles previously published in Putnam Magazine in 1855 that describe the natural beauty of Cape Cod and suggests that a trip to the beach, like many journeys into the wilderness, can be a spiritual journey. Published in 1849, the book is about a camping trip to the White Mountains that Thoreau took with his brother John in 1839. After John Thoreau died of tetanus in 1842, Thoreau decided to publish the book as a tribute to him and worked on the early drafts of the book while living at Walden Pond from 1845 to 1847. An article on the Thoreau Society website, titled Life and Legacy, explains that readers at the time also found the book to be problematic because it had a “looseness of structure and a preaching tone unalleviated by humor, that had put readers off.” These issues actually prompted Thoreau to hold off on publishing Walden so he could revise it and avoid these problems. The book was based on an essay in 1856, alternatively titled Getting a Living and What Shall It Profit?, that Thoreau later revised and edited for publication but died before being able to do so. It was finally published in 1863 in the Atlantic Monthly Magazine. Published posthumously in the Atlantic Monthly Magazine six months after Thoreau’s death in 1862, this essay discusses the history of the apple and how it came to grow and evolve over time. The essay is based on a lecture of the same name that Thoreau delivered at the Bedford Lyceum on February 14, 1860. Published in 1854 in the Liberator Magazine, this essay is based on a speech that Thoreau gave at an anti-slavery rally in Framingham, Massachusetts in July of 1854 after the re-enslavement of fugitive slave Anthony Burns in Boston, Massachusetts. The essay is considered a part of Thoreau’s “political writings” and since it explores concepts such as morals, ethics and laws, it is similar in nature to his other essay Civil Disobedience. Published posthumously in the Atlantic Monthly Magazine in 1862, this essay was based on a lecture that Thoreau delivered at Frazier Hall in Lynn in 1859. The essay is about nature in autumn and reflects on the changes that occur during this time. Midler, Robert. Reimagining Thoreau. Cambridge University Press, 1995. Princeton Alumni Weekly. Vol. 69, 1968. Berger, Michael Benjamin. Thoreau’s Late Career and The Dispersion of Seeds. Camden House, 2000. Thoreau, Henry David. Cape Cod: Illustrated Edition of the American Classic. Houghton Mifflin Company, 2008. Dean, Bradley P. and Gary Scharnhorst. “The Contemporary Reception of Walden.” Studies in American Renaissance, 1990, pp: 293-328.